Nani was sold to Manchester United for €25.5 million, five percent of which was paid to Real de Massamá. He passed his medical on 6 June 2007, and signed a five-year contract a month later, joining Portugal team-mate Cristiano Ronaldo—with whom he lived for a time at the start of his Manchester United career—at the club. Nani scored on his debut in a pre-season friendly against Shenzhen, netting the third in a 6–0 win. He also scored in the following game against Guangzhou Pharmaceutical with a chip off the right post from the left side of the penalty area in a 3–0 win. On 5 August 2007, Nani made his competitive debut for United, coming on as a substitute in the Community Shield against Chelsea. He marked his debut with a trophy after they won 3–0 on penalties, following a 1–1 draw during normal time. This was followed up by Nani's third goal for the club three days later, when he scored against Glentoran in another 3–0 pre-season win. Nani's Premier League debut came in United's opening match at home to Reading on 12 August as a substitute for Wayne Rooney, who had suffered a foot injury. Two weeks later, on 26 August, Nani scored his first competitive goal for United, netting a 30-yard winner in the 69th minute against Tottenham Hotspur. Nani also set up crucial goals for Louis Saha and Nemanja Vidić allowing United to beat both Sunderland and Everton 1–0. He returned to his previous club, Sporting, in a Champions League tie in September, though it was team-mate and fellow former Sporting man Cristiano Ronaldo scored the winner in a 1–0 victory. Nani opened the scoring in a 4–1 home victory over Middlesbrough on 27 October. 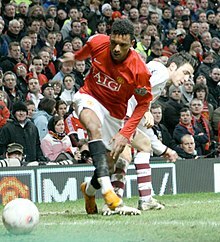 On 16 February 2008, Nani put in a man of the match performance against Arsenal in the FA Cup Fourth Round, his goal and two assists helping United to a 4–0 win over their rivals. During the match, Nani was involved in an altercation with Arsenal captain William Gallas who felt that the Portuguese was "showboating". After the match, Arsène Wenger was equally displeased, while Gilberto Silva said that Nani had a "big head". On 23 March, Nani set up the second and scored the final goal in a 3–0 victory over rivals Liverpool, in the 79th and 81st minutes respectively, after coming onto the pitch as a substitute. On 3 May, towards the end of a 4–1 win over West Ham United, Nani was sent off for the first time in his United career for a headbutt on West Ham defender Lucas Neill. On 21 May, Nani came on as a substitute for Wayne Rooney in the 2008 UEFA Champions League Final as United defeated Chelsea 6–5 on penalties following a 1–1 draw after extra time. Nani took and scored Manchester United's crucial fifth penalty in the shootout. Nani scored his first goal of the 2008–09 season on 23 September 2008, scoring United's third goal in a 3–1 win over Middlesbrough in the last minute to secure passage to the Fourth Round of the Carling Cup.On 18 October, he scored from a Wayne Rooney assist to complete the 4–0 rout of West Bromwich Albion at Old Trafford.On 20 January 2009, he opened the scoring for United in their 4–2 win at home to Derby County in the second leg of their League Cup semi-final. Breakthrough After Cristiano Ronaldo's transfer to Real Madrid in the 2009 close season, the weight of expectation was on Nani to step up from bit part player and replace his fellow Portuguese. Nani's first contribution to United's new season was opening the scoring in the 10th minute of the 2009 FA Community Shield, but United eventually lost the match on penalties after a 2–2 draw. Nani suffered a dislocated shoulder during the match, which was originally expected to keep him out of the start of the season.He recovered in time to play 17 minutes for Portugal against Liechtenstein on 12 August, however, and started the match against Birmingham City on 16 August. Although he provided the assist for Rooney's winning goal in the 34th minute, Nani was replaced by Ryan Giggs at half-time. On 22 August, Nani scored his first league goal of the 2009–10 season, netting a free-kick against Wigan Athletic in a 5–0 away win. Following several poor performances, Nani criticised Sir Alex Ferguson and his man management tactics.Despite this outburst Nani was given a chance to shine and provided an assist for Rooney in the 4–0 league win over Hull City. Soon after this positive display he put in another good performance in their League Cup semi-final victory over derby rivals Manchester City, revealing a heart-to-heart with Sir Alex Ferguson had resulted in a better display of form. On 31 January 2010, Nani scored the first goal and set up Rooney's 100th career Premier League strike in a 3–1 league victory over Arsenal at the Emirates Stadium. Nani's goal was first thought of as a Manuel Almunia own-goal by many sources, but was confirmed as belonging to Nani on 26 March by the Dubious Goals Panel.Following this performance, Nani then set up the second of a 5–0 home win over Portsmouth. – Sir Alex Ferguson praises Nani after his performance in the 3-1 victory over Arsenal on 31 January 2010. Just four days later, however, he was sent off for a lunge at Stiliyan Petrov against Aston Villa, which resulted in a three match ban and ruled him out of the League Cup final. On 10 March, Nani set up Rooney's second in a 4–0 win over Milan, before providing another assist for Rooney four days later in the 3–0 league victory over Fulham. On 26 March, Nani signed a new four-year contract with United, committing himself until 2014. A day later, Nani took his assist tally in the league for the season to nine as he set up two goals in a 4–0 win over Bolton at the Reebok Stadium, providing goals for Dimitar Berbatov and Darron Gibson. On 7 April, Nani scored his first ever European goals for United, netting two strikes in a 3–2 victory over Bayern Munich. Despite United winning the game, they were eliminated from the competition due to the away goals rule when the aggregate score was 4–4. On 24 April, Nani scored his first league goal at Old Trafford for 18 months, netting United's second in a 3–1 home victory over Tottenham Hotspur.On 2 May, Nani scored for the second game in a row, netting the only goal in a 1–0 away victory over Sunderland. Nani's third season with Manchester United ended with 34 appearances and seven goals in all competitions. On 22 August 2010, Nani missed a penalty in the 87th minute away to Fulham, and they then equalised two minutes later through Brede Hangeland to end the game 2–2. Six days later in a 3–0 home victory over West Ham United, Nani netted his first goal of the season and assisted Dimitar Berbatov in a Man of the Match display. Nani scored and assisted Michael Owen in a 2–2 away draw away to Bolton Wanderers on 26 September. On 16 October, Nani scored United's second in a 2–2 home draw against West Bromwich Albion.Four days later Nani scored his first Champions League goal of the season, netting the solitary strike in a 1–0 home victory over Bursa spore Nani scored a controversial second goal as United beat Tottenham Hotspur 2–0 at home on 30 October. Nani scored into an empty net after Tottenham goalkeeper Heurelho Gomes rolled the ball out to take a free-kick that he thought had been given for handball, however, play was allowed to go on as referee Mark Clattenburg did not blow his whistle. On 27 November, Nani scored United's fifth goal in a 7–1 home win over Blackburn Rovers. Nani netted his first goal of 2011 as he scored the winning strike in a 2–1 home victory over Stoke City on 4 January. On 22 January, Nani scored the final goal of a 5–0 home victory over Birmingham City. Nani netted United's only goal in their first league loss of the season, a 2–1 defeat at Wolves on 5 February. Seven days later Nani scored his first Manchester derby goal, opening the scoring in a 2–1 home victory over Manchester City. On 6 March, during United's 3–1 loss against Liverpool at Anfield, Nani was stretchered off the field following a challenge from Jamie Carragher just before half-time. It was thought that Nani would miss up to three weeks as a result of this tackle and would return in April, however, he recovered in time to play 61 minutes of a 2–1 victory over Marseille on 15 March. On 8 April, Nani was revealed as a contender for the Professional Footballers' Association (PFA) Young Player of the Year award alongside teammate Javier Hernández.However, many people, including Nani, expressed their surprise that he was not nominated for the main award.Following this nomination, he assisted both goals in a 2–0 home win over Fulham. On 18 April, Nani lost out to Jack Wilshere for the PFA Young Player of the Year award but he was however included into the PFA Premier League Team of the Year for the first time.